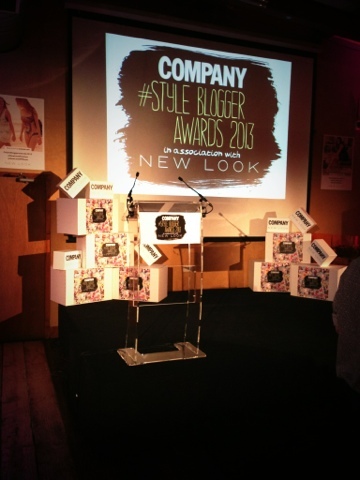 Company Magazine #StyleBloggerAwards - A fab night and a huge thank you! Last night The Afternoon Tea Club ventured to London to attend one of the hottest events in the blogging calendar - Company's Style Blogger Awards! Situated in the city's bohemian Shoreditch area, it was Champagne and glamour all the way at the super trendy (and super secluded!) Corbett Place venue. We had a fantastic time and there were lots of exciting things going on all around. We had so much fun crafting personalised sunglasses with Pinned it! Made it! and trying out gorgeous lashes with The Vintage Cosmetic Company. 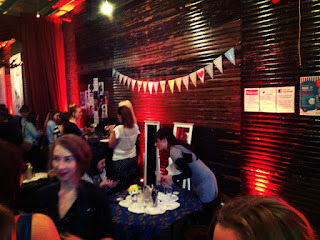 Plus we got to show all of this off in the Dream Booth - very bloggy indeed! Congratulations to all of the award winners. Unfortunately we didn't win Best Blogging Duo this year but a huge thank you must go to all who voted for us - it really does mean the world to know so many of you love the blog! 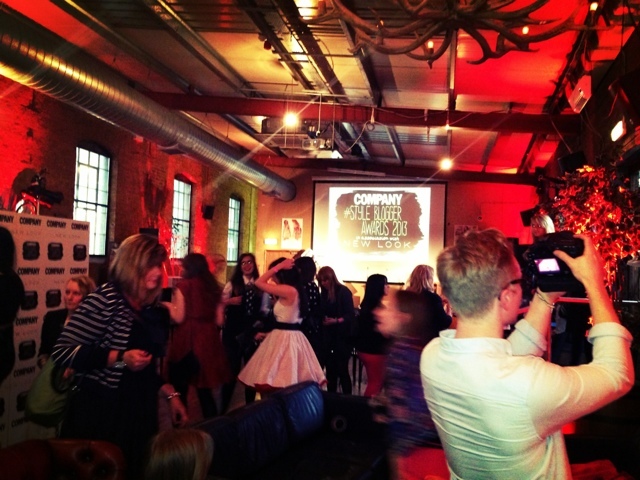 But we didn't leave empty handed - check out the fantastic goodie bag we received packed with beauty products, sweeties and of course the latest issue of Company. We could definitely get used to this! Don't forget! We're running for Best Food Blog in the Cosmo Blog Awards too. If you like what we do we would love for you to vote for us. Find out how here. 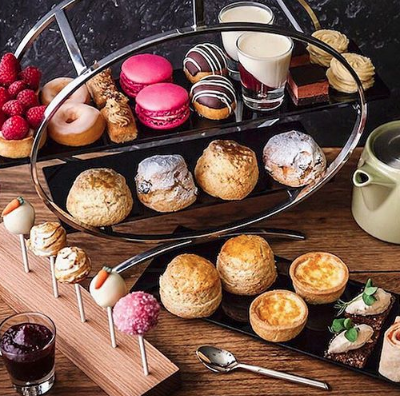 As self confessed cake-lovers and part time royal fangirls, we can't think of anything more perfect (or British) than a Coronation themed afternoon tea - So join us in our excitement as we present to you the Park Lane Hilton's brand new Afternoon Tea extravoganza! Guests can raise a toast to The Queen’s Coronation, celebrating 60 years since she was officially crowned Queen of the Commonwealth, with a regal Coronation Afternoon Tea at London Hilton on Park Lane. Located on Park Lane and overlooking Hyde Park, the landmark hotel is only a stone’s throw from Buckingham Palace, making it an ideal location to celebrate the coronation weekend. 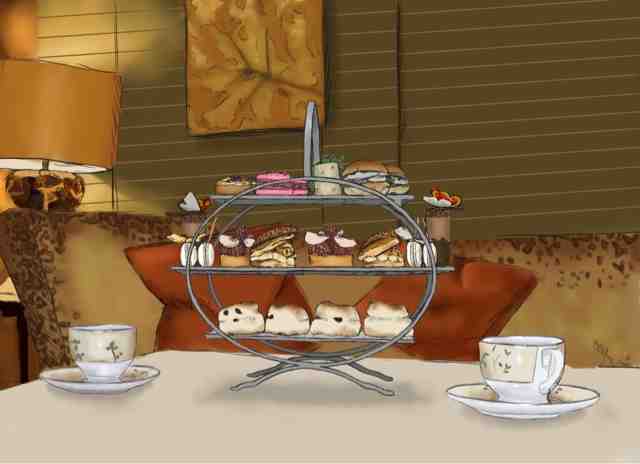 To commemorate this historic event, Podium Restaurant at London Hilton on Park Lane has created a limited edition Coronation Afternoon Tea. Created by Executive Chef, Anthony Marshall, this delicious variation of the hotel’s celebrated afternoon tea includes an elderflower jelly diamond presented on a purple cushion made of chocolate mousse and praline; a vanilla and blueberry macaroon; a dark chocolate edible picture frame encasing an image of Her Majesty’s coronation; a 1953 Queen’s Coronation stamp on a cupcake; a crown-shaped sable biscuit iced with the royal colours and a blueberry cupcake finished with gold leaves. Now we don't know about you, but we think that sounds pretty marvellous - especially the edible Chocolate Mousse and Praline. What do you think? Will you be toasting her Majesty with a glass of bubbly and blueberry macaroon? Let us know your thoughts in the comment section below or at @TeacupReview! Eric Lanlard has launched yet another beautiful afternoon tea collaboration with the Jumeirah Carlton Tower! If you've read the blog before, you'll know that we're massive Lanlard fans - so you can imagine our excitement upon hearing the news of his brand new Chelsea Flower Show Tea! London’s iconic Jumeirah Carlton Tower continues its collaboration with master patissier and star of Channel 4’s Baking Mad series Eric Lanlard with the launch of his new Mon Beau Papillon afternoon tea. Eric’s new afternoon tea is inspired by his observation of butterflies flitting between beautiful flowers and the different petals they select to land on, inspiring him to include a variety of flavours and colours to replicate the mixed beauty of nature. Working closely with Executive Chef Simon Young, the two have united their creative culinary minds to deliver an inspiring take on afternoon tea, which will be available in the Chinoiserie from 8th May. The menu begins with a section of savoury delights including a mini raspberry macaroon with smoked duck and smoked chilli jelly, a mini brioche bun with thyme blossom and grain mustard smoked chicken and jasmine smoked salmon and goats curd tart, finished with an asparagus and pea shoot wrap. Then, to satisfy even the most discerning sweet tooth, a selection of pastries, cakes and desserts that combine elegant and subtle flavours to delicious effect. 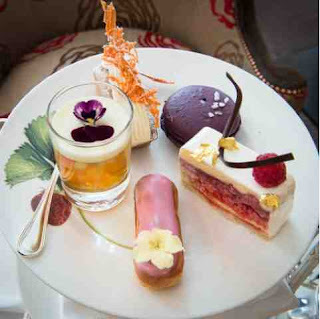 From a mini raspberry and basil tart with white chocolate, dark chocolate spoon with morello chocolate mousse, white chocolate macaroon with strawberry marshmallow ice cream and a pear and walnut choux bun, the Mon Beau Papillon afternoon tea is a decadent and memorable experience. With remarkable attention to detail, Eric ensures there are miniature white chocolate butterflies on the dark chocolate spoon and white chocolate macaroon, to combine his initial inspiration with the complete afternoon tea experience. Will you be popping over to the Jumeirah Carlton Tower to sample these summer delights? Have you been already? Let us know your throughts! Leaf is the ideal spot for creative types. It's arty, modern and home to crafty events like the arts fair taking place during our visit. It's also a great venue for Afternoon Tea with apt space for dining and various seating options to suit large families and casual diners. I love the huge windows in the upstairs dining area, they let in great natural lighting give the venue a real fresh feel. The blue walls and high ceilings are just gorgeous and they're accented with beautiful grand plasterings, toned down by rustic chips in the paintwork which make it all the more loveable. It should be impossible for ceiling glitter balls to look good but somehow Leaf pulls it off - and completely affirms it's cool. Fully adorned with nineteenth century cornices and accented beautifully with an array of glitter balls, Leaf's first floor tearoom is a triumph of contemporary and traditional fusion. Personal highlights include their lovely full length windows and subtle blue decor which create a wonderfully calm environment, perfect for relaxation and a gossip with the girls! Presented on pretty cake stands with a cute Swallow decoration on top, this is a very attractive Afternoon Tea - and it's super reasonably priced. To start there's a selection of 4 sandwiches; hummus, cheese, chicken and tuna. The chicken was gorgeous, really chunky and served on wonderfully soft bread. My favourite however was the hummus, a rather unusual sandwich filling but worked really well. Instead of traditional scones our second tier was filled with strawberry shortcake. 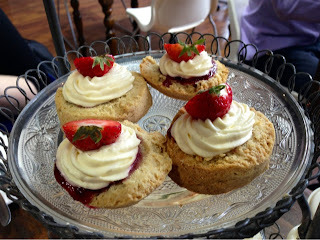 Topped with fresh strawberries and filled with jam and cream, these were a great alternative to classic fruit scones. Finally our dessert selection had just the right combination of creamy cakes, chocolates cakes and well, cakey cakes. We had; a traditional Victoria sponge which was gorgeous and light, two mini profiteroles, again really light cream and the chocolate was a real winner for me, and finally a mini lemon posset topped with blackcurrants. Fantastic selection and just the ideal amount of food. 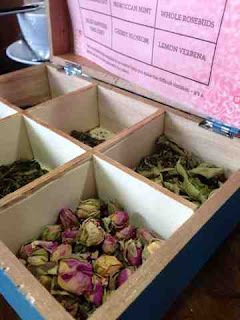 The tea selection was also presented really nicely in cute cornflower blue wooden boxes with labels for each flavour. I chose Blue Sapphire Earl Grey - partly because it smelt lovely but largely because the name sounded cool. Topped with milk and sugar, it was wonderful and my pot was consistently refreshed. Afternoon Tea at Leaf offers a good selection of cakes and sandwiches, at an exceptional rate - £10.95 pp. Upon arrival guests are presented with a beautiful wooden tea caddy full of leaves to smell and sample, offering an exciting start to the meal. I very much enjoyed the caddy experience and loved having the teas on hand to help with the tough decision making process. On this particular occasion I opted for the Cherry Blossom tea which was wonderfully fragrant and fruity. Presented on a lovely ornate stand, the tea itself comes equipped with all of the essential afternoon tea ingredients. To start we were treated to a finger sandwich selection which included: Tuna; Chicken; Cheese & Pepper; and the unusual Hummus. Being the cheese fiend that I am, the cheese & pepper sandwich was always going to be a clear winner, but as Laura said, the Hummus was a welcome addition and added an interesting slant to the meal. The strawberry short-cake-scone twist was similarly surprising but incredibly delicious. I particularly liked the presentation of the second tier with each scone being decorated with whipped cream, jam and a half strawberry - just the way I like it. As with everything else on the menu, the cakes were also delicious, offering a good selection of flavours and variety. The choice included a zesty lemon posset, Victoria Sandwich and profiteroles - my favourite by far was the posset which was fabulously refreshing! The setup at Leaf is great as the downstairs area is primarily a bar space and upstairs is reserved for food and bookings so staff are readily available to assist diners. 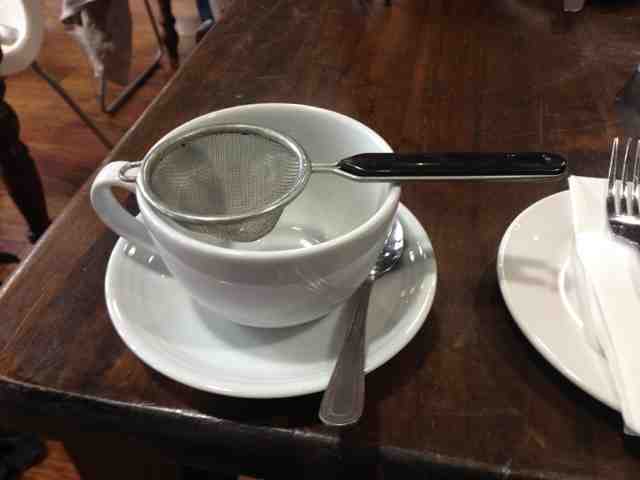 Our server was really friendly, leaving up with enough time to select tea options and checking our table regularly. The service at Leaf was swift, efficient and knowledgeable, with the staff being readily on hand to explain the menu and offer top ups as required/desired - very pleasant! I really do like Leaf. It's modern yet very relaxed at the same time and has so much going on which keeps it vibrant and fresh. It's a popular venue and the prices are great. If you're after city chic and a value for money Afternoon Tea - look no further than Leaf on Bold Street. 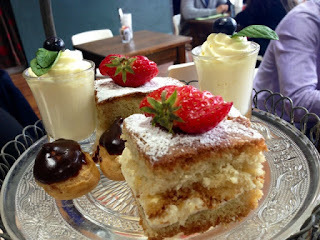 I really enjoyed our afternoon tea at Leaf and wouldn’t hesitate to go back again. Its off-beat environment is ideal for anyone in search of an informal tea with a hint of glitz. Leaf is located on Bold Street Liverpool. 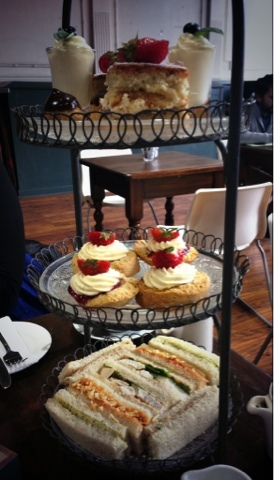 Afternoon Tea is served from 12pm-5pm Saturdays and Sundays. Booking essential. £10.95 or £13.95 with a glass of sparkles or Iced Champagne Cassis. Please visit their website for menus and more information. If you're still looking for the perfect Chelsea Flower Show tea, then look no further. Visit Brown's today to celebrate the centenary in style! 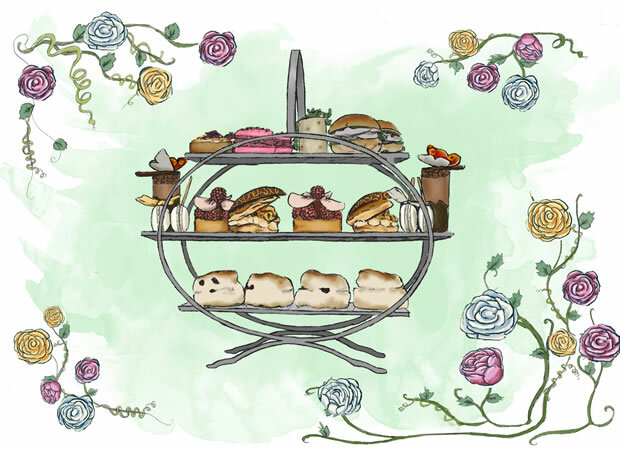 The English Tea Room will be serving a specially created Traditional Afternoon Tea with a Chelsea Flower Show twist. Indulge in warm scones with rose and strawberry jam, a selection of home-made pastries including violet macaroons, carrot and jasmine cakes, raspberry and white chocolate mousses, rosewater éclairs and Pimms jellies along with a selection of freshly prepared sandwiches. This will be served with a choice of 17 different teas which include both Rosebud or Jasmine Tea. What do you think? Comment below with your thoughts or tweet us at @TeacupReview! 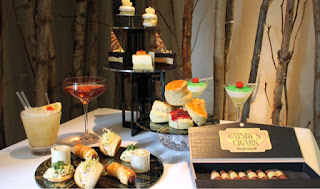 The cost of this special afternoon tea is £39.50 per person and will be available from the 21st – 27th May 2012 from 3pm - 6pm Monday to Thursday, 2pm - 6pm Friday and 12noon – 6.30pm Saturday and Sunday. Celebrate the 100th Anniversary of the Chelsea Flower Show at the Corinthia! Ever wondered how the garden would taste if it were made of cake? Of course you haven't, but now you don't have to because the Corinthia has created a an Afternoon Tea garden for your delectation. 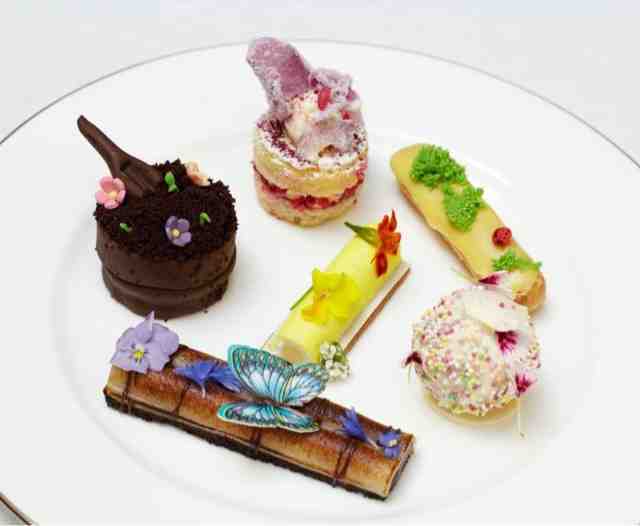 Celebrate the Chelsea Flower Show in style with a chocolate bamboo skewer and edible flower pot. In celebration of the RHS Chelsea Flower show our dedicated pastry team at Corinthia Hotel London have created a unique Afternoon Tea with a floral theme.Almond and poppy cake raspberry mousse will take the guise of the delicious “Wild Meadow Garden” or a chocolate fudge cake with chocolate frosting and fresh cherries, decorated with a trowel and hose pipe will be referred to on the menu as “Potting shed”.You will be sure to leave the experience feeling very floral indeed! What do you think? Let us know your thoughts in the comments below or at @TeacupReview! Prepare your taste buds for the launch of OXO Tower's brand new Charlie and the Chocolate Factory 'Not Afternoon Tea Experience' - Be sure to book your golden ticket today! It may not be the Great Glass Elevator, but from the moment you step out of the lift on the Eighth Floor of the OXO Tower we promise an adventure for the taste buds to rival Willy Wonka’s very own creations. 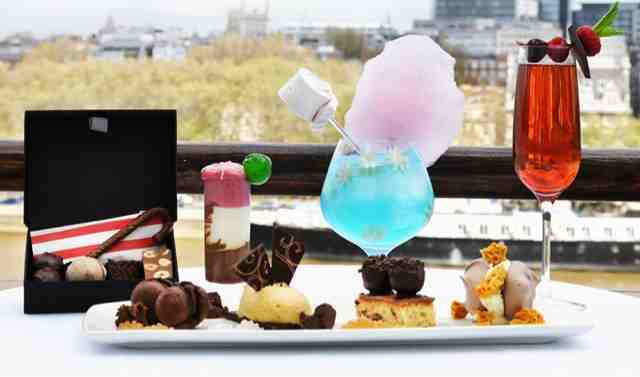 Choose from the four Not Afternoon Tea plates on offer (featuring a selection of delicious desserts perfectly partnered with a bespoke cocktail) and opt for the Charlie and the Chocolate Factory experience for the ultimate taste sensation. A naughty but very nice Neapolitan Hot Shot sets the tone mixing Celaya hot chocolate with vanilla syrup and layered with white chocolate and strawberry foam. Sip on a Snozberry Slurp as you enjoy your choice of desserts and revel in sensory pleasure and childhood nostalgia with homemade ice cream jelly flowers, candy floss garnish and marshmallow twirl. The happily-ever-after ending comes in the form of a Box of ‘Children’ Truffles, which features delectable treats characteristic of the lucky Willy Wonka Golden Ticket winners – such as the Violet Beauregarde blueberry macaroon with violet ganache. Enjoy at the theatre as the musical unfolds, or take home to experience later. So what do you think? We're loving the sound of those Snozberry Slurps - yum. Comment below or tweet us at @TeacupReview with your thoughts. Get a glimpse of the glamorous Charleston era with this fabulous Great Gatsby inspired Afternoon Tea! Today marks the launch of The Great Gatsby Experience at Prima Donna Brixton to coincide with release of The Great Gatsby movie which opens in cinemas today. To celebrate, why not engage in the traditions of a by-gone era and treat yourself to the elegant past time of Afternoon Tea with the launch of Prima Donna's brand new tea menu. Located within Market Row, Brixton South West London, the restaurant is a fusion of Latin and European cuisine, served within a beautifully decorated environment and is the perfect place to enjoy a luxury coffee and a slice of cake - minus Leonardo Dicaprio! The launch of the new tea menu includes very affordable Afternoon Tea, unlike the traditional pricing plans which usually charge per person, Prima Donna will charge per quantity of food ranging from just £8.50 for 2 sandwiches, 2 slices of cake, 1 scone and one biscuit. Other larger menus are available the largest costing £28 for 5 slices of cake, 3 scones, 2 biscuits and 6 sandwiches. All the cakes are hand made by the Patissier and include Lime and Pistachio cake, Tart au Citron, Blackcurrant macaroons, Sea salt caramel and Fruit gateau. 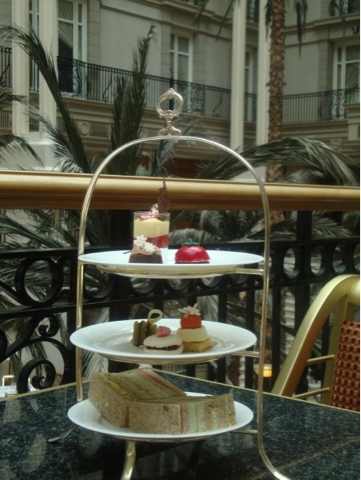 The Afternoon Tea menu will launch Friday 17th May 2013 and will run from Mon-Thurs 12-4 and Fridays 12-7. We're already donning our flapper dresses and dreaming about Blackcurrant macaroons! Are you feeling inspired? Let us know your thoughts. The Great Gatsby Experience is available from today, 17th May and will be available Mon-Thurs 12-4pm and Fridays 12-7pm. Prices start at £8.50. 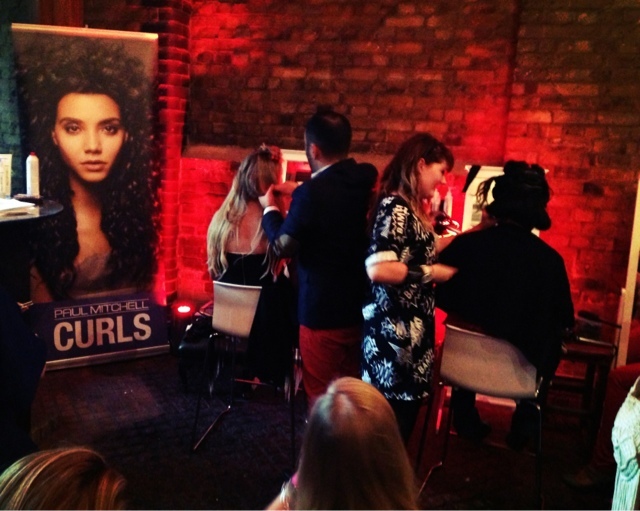 For more information and to book visit http://www.primadonnabrixton.co.uk/. We're asking for your support... again! Whether you've just found The Afternoon Tea Club or have been following for a while now, we’d be thrilled if you could nominate us as 'Best Food Blog' in the Cosmo Blog Awards 2013. 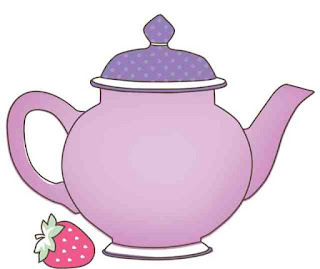 A Strawberry Tea is a fun and easy way to support Breast Cancer Care. Simply get together with friends and family, buy or bake the cakes, add some strawberries, put the kettle on and away you go! Whether you host your Strawberry Tea at work in your tea break or have a picnic at a local park – a Strawberry Tea can be as extravagant or as simple as you like! It’s the perfect excuse to catch up with friends, family or colleagues and tuck into delicious treats, all the while raising money for people affected by breast cancer. It’s a fun and easy way to support Breast Cancer Care and it doesn’t matter if you raise £20 or £200 at your Strawberry Tea because every penny will help them support more people affected by breast cancer today. - Have a bake-off and get everyone to vote on their favourite cake! A diagnosis of breast cancer and the treatment that follows is a devastating experience for anyone. Breast Cancer Care provides expert information and skilled support through a range of services for anyone affected. Their free helpline, website and online forums offer a friendly ear and expert information for those dealing with this life-threatening disease. Across the UK we offer a range of confidential, face-to-face services for people living with and beyond breast cancer. Will you be hosting a Strawberry Tea? Comment below or tweet us with your menu ideas and photos! 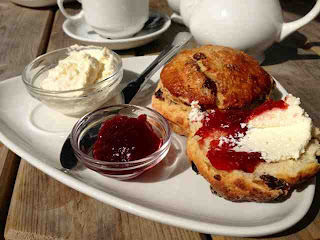 If like us, you're partial to a good scone, then you'll love what we have to show you today. 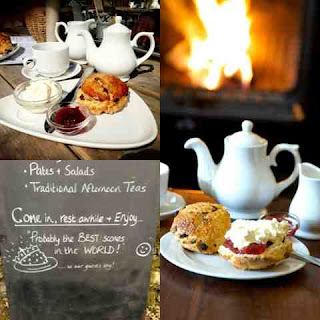 Boasting 'the best scones in the world' (and a lovely pot of Earl Grey) Cote How Organic Tea Rooms are a real must if you're ever in the Rydal area. Be sure to pay them a visit of you're ever in the area - like the sign outside says, they really do have 'the best scones in the WORLD! Their ethically sourced Cream teas start at £5.00 and are served daily inside their tearoom or on the terrace. For more information about Cote How and the various Afternoon Tea Packages available, please visit their website. 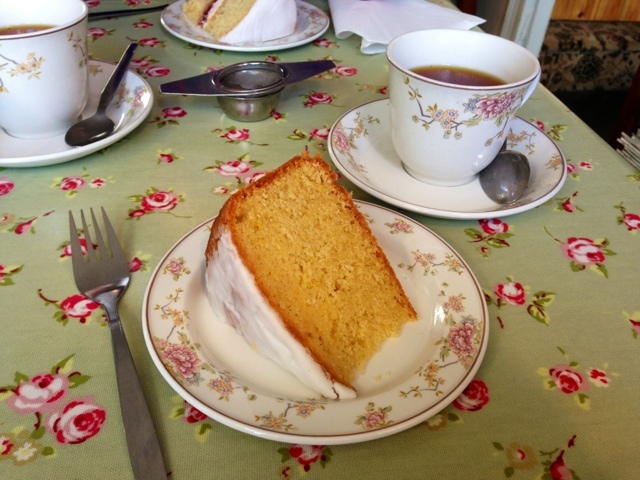 A few weeks ago, I headed off to the Lake District in search of country settings, cagoules and cake - Luckily I found all three in abundance. Situated in the heart of Beatrix Potter's one-time-home, Hawkshead, Grandy Nook Tearooms offer traditional English food (and cake, lets not forget the cake) in relaxed-country settings. 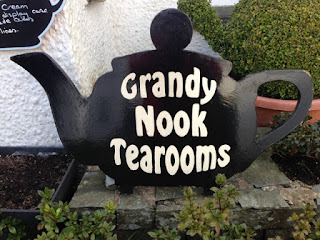 Highly recommended for anyone wanting a quick afternoon tea in Hawkshead. 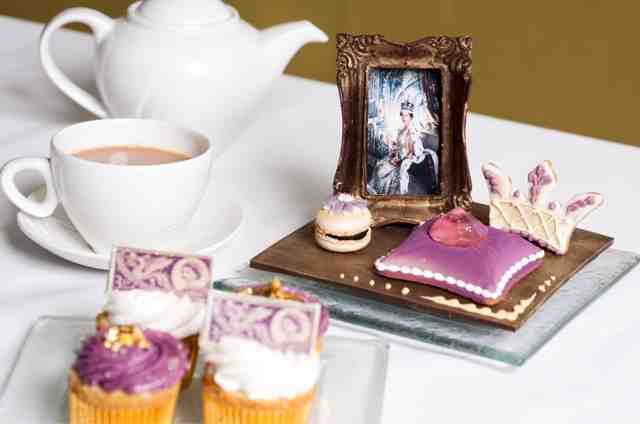 Can you imagine anything more perfect than a Charlie and the Chocolate Factory inspired Afternoon Tea? No? Neither can we. In celebration of the new Willy Wonka Musical, the Chesterfield Hotel is launching a brand new chocolate inspired tea - If you love Roald Dahl this could be just the (golden) ticket! "Roald Dahl’s deliciously dark tale of Charlie Bucket and the mysterious Willy Wonka comes to life in a brand new West End musical directed by Academy Award® winner Sam Mendes – and to celebrate we've introduced a wonderful Willy Wonka inspired twist to our Traditional Afternoon Tea Menu. Tea here is already legendary – for the third year running we’ve received the "Award for Excellence" from The Tea Guild for an 'Outstanding Afternoon Tea'. We serve a delicious selection of home made cakes and pastries prepared by Tom, our chef pâtissier – you can tuck into a selection of finger sandwiches, cupcakes, scones, macaroons. 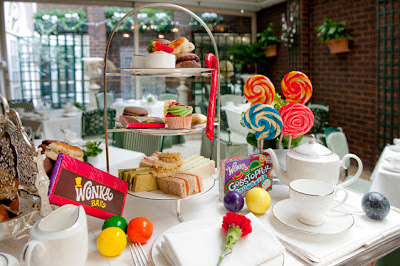 For our Charlie and the Chesterfield Afternoon Tea we’ve added Wonka Bars, Oompa Loompa cupcakes, fizzy lifting drinks and candy canes of all sorts to our Traditional Afternoon Tea. And as well as our extensive selection of the finest loose leaf teas you can enjoy hot chocolate and ice cold milkshakes." Have you got a golden ticket? We can hear those Wonka Bars calling our name already! What do you think? Will you be securing your golden ticket soon? We'd love to hear your thoughts. 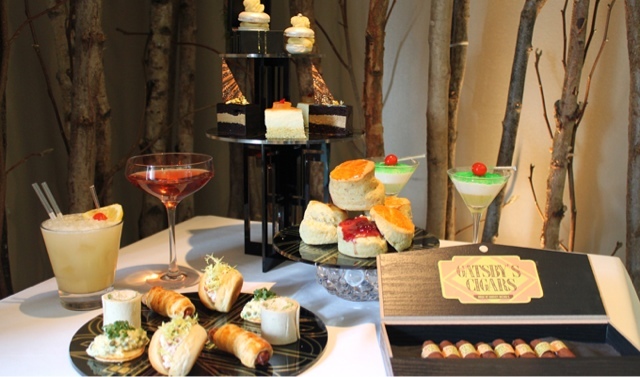 The Charlie and the Chesterfield Afternoon Tea will be served daily from Monday 13th May until Sunday 1st September 2013 at the Chesterfield Hotel, London. Booking is essential. Call +44 (0) 20 7491 2622, email bookch@rchmail.com or visit their website for more information or to make a reservation. Ever wished that you could step back in time? Harvey Nichols' Great Gatsby* tea may be just the thing for you! For a heady, whirlwind of delicious pleasure that embodies the antics of the infamous, albeit fictional, opulence of a Great Gatsby party then head to the Fifth Floor for a truly unique afternoon tea experience. Hedonistic and luxurious, the menu incorporates the key symbols of the jazz era with Lobster rolls, prohibition cocktails and peanut butter roll-up ‘Gatsby’ cigars. 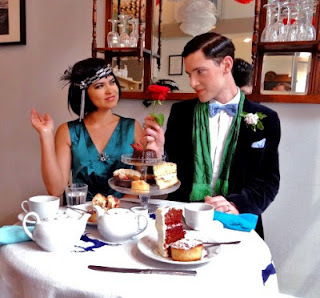 So transport yourself back to an era of decadence and toast to the twenties with our stunning Roaring 20s Tea. Choose either a coupette of Champagne with gold leaf, or a prohibition cocktail from the trolley. Are you as excited about this as we are? Let us know your thoughts! The Roaring 20s Afternoon Tea will be available at SEASON at the Fifth Floor from 1 May. Served daily from 3pm – 5pm. Prices start at £30 for Afternoon Tea and £40 to include a prohibition cocktail or 125ml coupette of Champagne with gold leaf. Visit their website for more details. 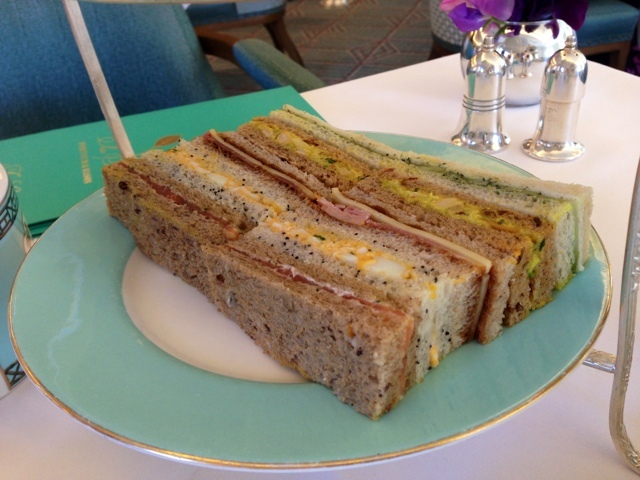 Last week The Afternoon Tea Club was invited to spend the day at Fortnum and Mason's Diamond Jubilee Tea Salon. With Royal links and a menu to sing about, this was certainly an experience to remember. 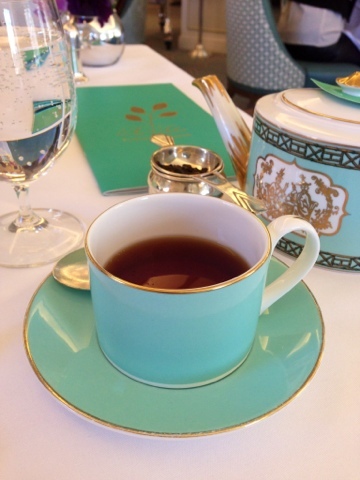 As a self-confessed Royal enthusiast, you can imagine my delight at being invited to spend the day tracing HRH’s footsteps, at the prestigious Fortnum and Mason Diamond Jubilee Tea Salon. Located on the store’s fourth floor and decorated throughout in calming pastel hues, this pretty tea room is the image of refinement, with clean white tablecloths and comfortable leather armchairs completing the look, whilst also adding a touch of luxury for good measure. The wonderful pianist who accompanied our tea was a particular highlight, playing a selection of movie classics from bygone days - as well as a touch of Andrew Lloyd Webber for variety. I found this aspect to be quite enchanting and thoroughly enjoyed humming along to the Phantom's ‘Think of Me’ whilst eating my scones - All they need to do now is getJohn Owen Jones on vocals and they’ve got the perfect entertainment package! Just a ten minute stroll from Her Majesty’s humble abode, The Diamond Jubilee Tea Salon serves to create an atmosphere of high class elegance and luxury dining. Put on your best tea dress and pearls (or trousers for you gentleman tea lovers out there!) and get ready to experience how London does Afternoon Tea. With ocean hues cascading through the lounge and minimilistic white and cream to set the scene, there’s something quite understated about this grand Tea Salon which makes it all the more admirable. Everything from the chairs to the china to the coffee cakeis woven together under a pastel colour palette and done in such a way that it seems effortless. There’s even a live pianist to entertain guests whilst dining which definitely added to the stylish tone. I loved the paneling on the walls and the ceiling beams by the large window bays which let in the perfect amount of natural lighting onthis particularly sunny afternoon. This tea room is the absolute picture of British AfternoonTea. 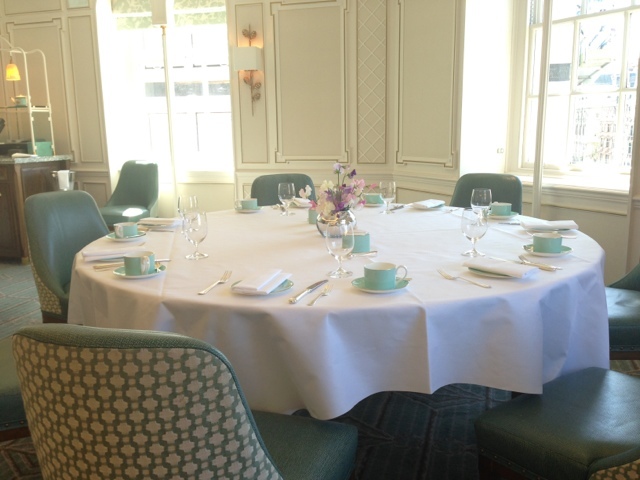 Presented in a minimalist fashion (but with unlimited refills and replenishments) the Fortnum and Mason Afternoon Tea presents simplistic elegance at its best. 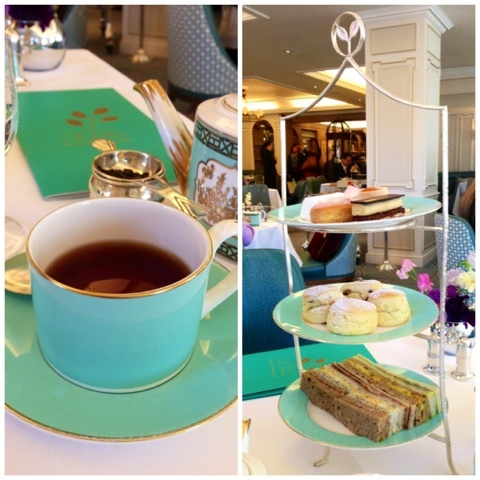 Displayed on two Tiffany-blue cake stands (one for food and the other exclusively for jams and conserves) The Diamond Jubilee Tea Salon provides one of the most gentile experiences that we have encountered to date. The menu itself is very traditional, with a selection of mixed finger sandwiches to start, followed by scones (plain and fruit), before the final patisserie piece de la resistance. As you might expect, the sandwiches were lovely and fresh, being served on a variety of white, brown and seeded breads, in a selection of flavours (Ploughman‘s: Ham, Cheese and Pickle; Salmon and Cream Cheese; Cucumber and Mint; Egg and Mustard Cress; and Coronation Chicken) Out of this choice, my favourite had to be the hearty Ploughman’s, which was filled with lovely carved ham, good quality cheese and pickle, making for a very substantial finger sandwich. In at second was the Cucumber & Mint, which was incredibly refreshing and the perfect palate cleanser between tiers - definitely one to try again at home! The scones on the second tier were the closest to perfection that we’ve had so far, with a great rise and lovely sugary after-taste which is perfect for those with a sweet tooth (like myself). I also particularly appreciated the inclusion of Lemon Curd in the preserve selection, which although unexpected, turned out to be a taste revelation and something which I definitely want to try again soon. 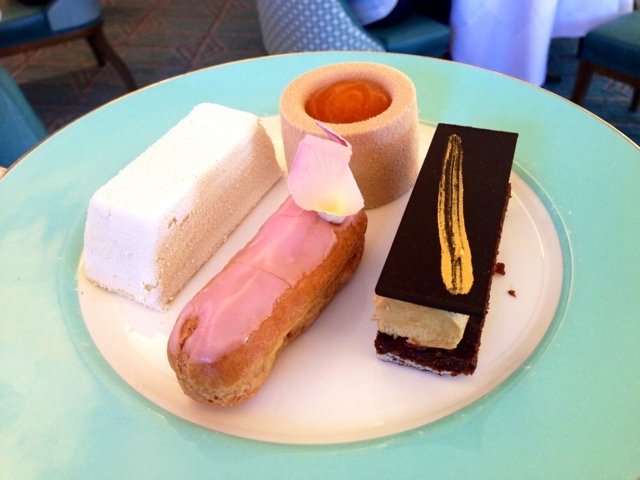 Visually well balanced and perfectly formed, the top tier of Fortnum and Mason’s afternoon tea was a treat to behold, with selections that included: a Raspberry and Violet éclair (with floral decoration); Pistachio and White Chocolate Moose Cake; Coffee and Chocolate Cake; and Apricot Mousse. The winner by far, on this occasion, was the Coffee Cake, which had a brilliant consistency being wonderfully creamy and crunchy all at once - yum! 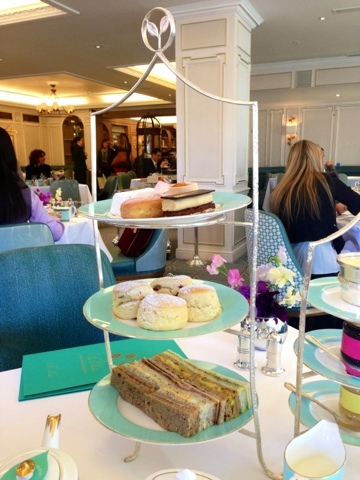 In addition to the food that we sampled, Fortnum and Mason also offer a very good selection of alternative Afternoon Teas which include a children's option (boys and girls), as well as Savoury and High teas for those looking for something a little more substantial. 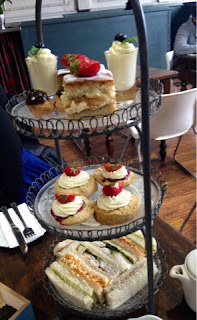 This afternoon tea was probably the most quintessentially British tea we have experienced. By concentrating on quality and keeping thespirit of traditional Afternoon Tea alive, we indulged in a selection of afternoon favourites that were the epitome of class and sophistication. Presented on Tiffany blue china with a worn effect that gave it a sense of history, I absolutely fell in love with the arrangement – what a sight to behold! 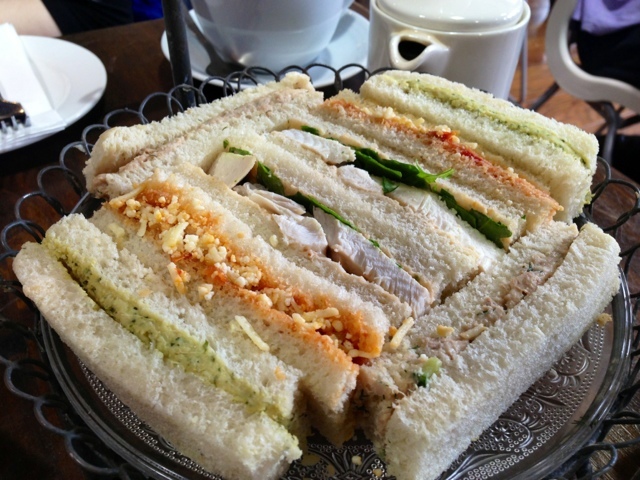 To start we had a selection of fine finger sandwiches. What I really appreciated about these were the different breads each flavour was presented with. The different textures of poppy seed and wholegrain loaves really made the difference and were just one great example of the added details here at Fortnum and Mason. Like Caroline said, there were 5 varieties of sandwich on offer, all of excellent quality. My favourite was the Coronation Chicken, bursting with flavour and a good amount of filling. Of course I wasalso a fan of the salmon which was wonderfully tender and served on perfectly fresh bread. 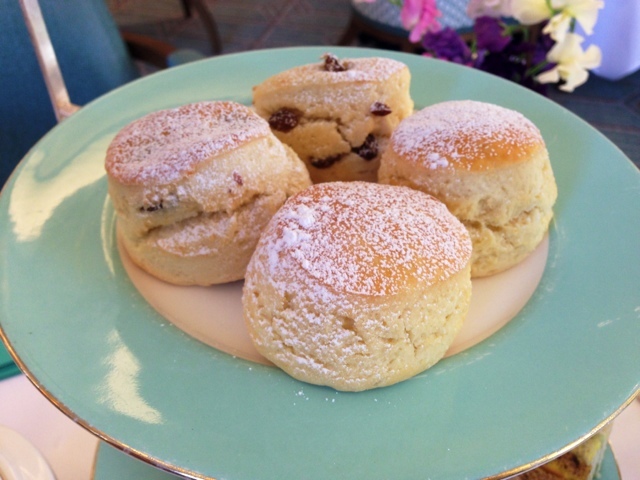 Next up and with the award for ‘Best So Far’ were, drumrollplease … the scones! With a choice of both fruity and plain I almost rushed past the sandwiches to get to them. Just the right size and lightly dusted with sugar, they were my idea of perfect. We even had a choice of preserves too which was a nice surprise. Classic raspberry jam and also Lemon Curd, particularly great with the plain scones and a nice contrast to have such a zesty flavour in between courses. For the finale we had some of the most beautiful desserts I have ever seen. Each as special as the last, we had a choice of four including Raspberry Éclair, Coffee and Chocolate Cake, Chocolate Mousse Cake and Apricot Mousse. The coffee cake was amazing, it had so many different textures with a creamy centre and biscuit base but my favourite was the Apricot Mousse. My only suggestion would be that maybe there could have been a slightly more cakey option or possibly a tart as all of the desserts were primarily cream based and this was quite filling after our unlimited sandwiches! 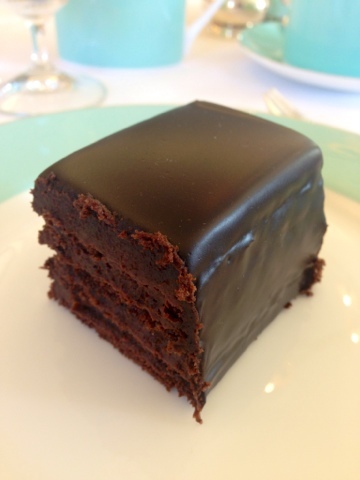 However, Fortnum and Mason’s signature cake stand certainly made up for this as we were given the choice of special bakes including Battenberg and Chocolate cake. Obviously we chose the chocolate and oh my did we make the right choice – a generous size too! From the lovely lady on reception, to the charming waiter and assistant manager who chatted to us after our tea, everyone at Fortnum and Mason was incredibly welcoming. Their service style was attentive, without being at all imposing and we were made to feel very much at home throughout - a real treat! 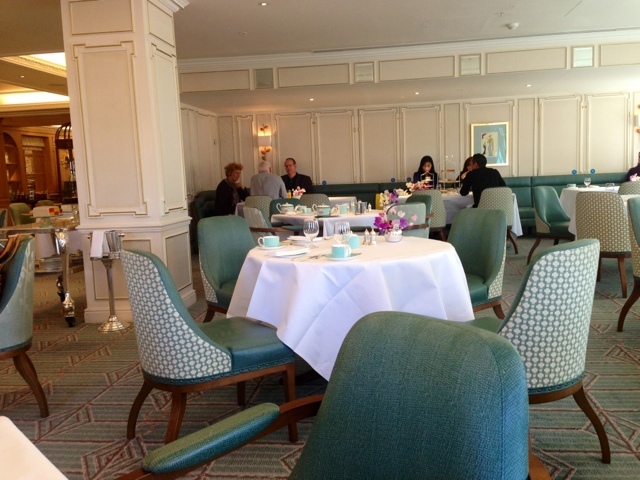 The service at Fortnum and Mason was immaculate. From being greeted at the desk right up to collecting our coats, we were attended with the upmost care. Particular mention must go to our server David who was really friendly and professional and also assistant manager Christopher who was extremely personable and kept this very busy tea room running smoothly. 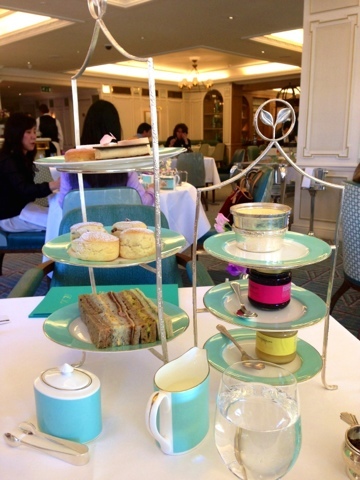 If you’re looking for somewhere to really treat yourself and experience Afternoon Tea at its very best then Fortnum and Mason is your go to place. Everything is done to the highest of standard and really takes you to a completely different world of relaxation and class. I would return even just for the scones. This is exactly how Afternoon Tea should be. Considerably more intimate and flowery than its Ecclesall Road sister, the original Fancie is everything that's good and girlie. Decorated throughout in Cath Kidston-esque patterns (which include stars, polka dots and pretty florals) and enhanced with quirky table games and vintage pieces, this shop is the perfect place to escape from the humdrum of student life. The shop's main focus is on the lovely cupcakes (twelve varieties nonetheless) which are produced daily in the Fancie Bakery, offering a variety of distinctive flavours. As a treat after our tea, we were given a couple to take home. Without hesitation I went for my favourire 'Red Velvet' and their unusual 'Raspberry and Almond' Cupcakes. Needless to say both were delicious. As a bit of a cupcake fanatic (and baker in my spare time) I always like to judge cakes by their buttercream - It HAS to be perfect and anything less just will not do. I'm pleased to say that the icing in both cases was immaculate and exactly in line with my standards. Well done! Fancie’s cute cupcake café is where it all began and I can certainly see why it’s still so popular today. Decked out in hot pink and white it’s a complete contrast to its sister Canteen bakery and oozes home-baking charm. Set out open plan, there’s a family feel here with patterned tablecloths, pretty teacups and even children’s artwork pinned to the fridge with alphabet magnets - very sweet and welcoming. The cupcakes themselves were absolutely gorgeous. 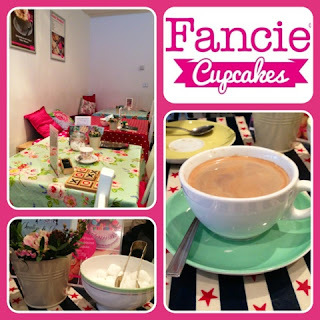 Like Caroline said we had a choice of Fancie’s 12 signature bakes and I went for gorgeously girly Pink Marshmallow and Cappuccino cupcakes. The sponge was lovely and moist and to join in Caroline’s buttercream fan girl moment, yes the buttercream was AMAZING. 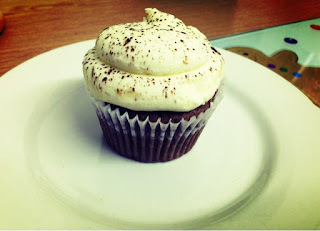 My favourite was the marshmallow cupcake simply for being the pinkest cake I have ever seen – oh and it was yummy! This mini cupcakery also has quite a large range of drinks on offer so to finish our day I sipped on a vanilla latte - which could very well be my new favourite hot beverage! Fancie is located on Sharrowvale Road, Sheffield. Cupcakes can be ordered to go or can be enjoyed in the shop between 9-5pm Monday to Saturday and 11-5pm on Sundays. For more information check out the website HERE.